All summer long, Miga rides waves with local surfers. 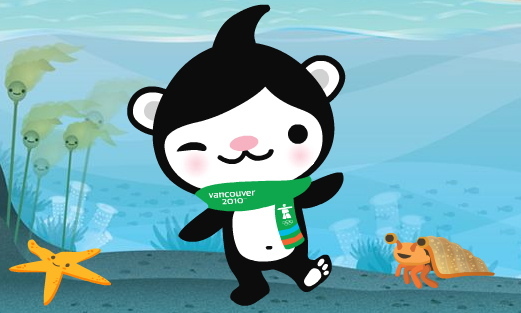 But during the winter months, she often sneaks onto the shores of Vancouver to seek adventure. When Miga discovered that humans were ‘surfing’ on snow, up in the mountains, she knew she had to join the fun. Snowboarding soon became her favourite winter sport. Her dream is to land a corked 720 in the half-pipe one day…It will take lots of practice, and a few falls along the way, but she’s sure she can do it. The sea bear is inspired by the legends of the Pacific Northwest First Nations, tales of orca whales that transform into bears when they arrive on land. The Kermode bear is a rare white or cream-coloured sub-species of the black bear that is unique to the central West Coast of British Columbia. According to First Nations’ legend, Kermode bears – also known as Spirit Bears – were turned white by Raven to remind people of the Ice Age. Orcas are also honoured in the art and stories of West Coast First Nations, as travellers and guardians of the sea. Hobbies: Surfing, snowboarding, anything fun and exciting! Now that you’ve been introduced, get to know Miga a little better by playing the Miga Moves game! This entry was posted in Uncategorized and tagged Meomi, Miga, Quatchi, video. Bookmark the permalink. It’s crazy how that baby is all “meh” about Quatchi and Sumi, but when he sees Miga, he goes totally bonkers! I assumed the baby was a she! Perhaps the baby is indeed a girl. Maybe that’s why she flips out, since Miga is the only girl mascot of the three. She thinks Quatchi and Sumi are stupid. The real-life Miga in the hula-hoop video isn’t nearly as coordinated as her animated self in the Miga Moves game. I think that the Quatchi doll was made in China and the kid was traumatized by the lead paint content. Miga may have produced in Canada, meaning it contains codeine, which all babies love.